Class started today here in Chicago, and so starts my second semester at UIC. As per the schools structure this semester involves all of my class having all of our classes together. Here is the rundown. Our studio, ARCH 552, is entitled 'Take Five.' It will involve five three week stages, 'each indebted to the former and each doubling the size, number, and scale through a series of staged blow-ups.' With phase resolution will be added to the assignments with the changes in scale. The studio 'is founded on the premise that architecture is an intellectual discipline predicated on conceptual clarity, formal experimentation, and argumentation.' Through the use of basic architectural techniques of representation and production, the studio will explore form, quantity, and scenario. This means many iterations of plan, section, model, and diagram. For our first assignment we are to build a slough of small 4"x4" massing models out of 1/32" PVC shower pan liner. We most bend, cut, fold, carve, create something of slice of an infinite system. As each section will not be revealed until the former is finish we have no idea where this is going and what the end result will be. So stay tuned. I'll let you know as soon as I know. Over winter break everyone at UIC (or at least the Grads, I dont really know what is going on with the undergrads, sorry) had to produce a portfolio of their design work up to that point in the university. These will be used to choose projects for the Year End Show. As my class only had one project, ours were a bit skimpy, But I think I like this tradition as it keeps us producing our work in presentable form. Here is mine for your perusing. This version of my portfolio is something of a Vol.2 to the portfolio that I used for admissions to school. The idea being that at the end of school I will have a 'box set' of all of my academic work. For reference, here is my older Undergrad portfolio. Along with a new portfolio I spent a few days building a new personal website. I needed a place to show everything I do in one spot. Photography, Design, Motion Graphics, and website design. I am pretty happy with it. I am still experimenting a bit with interface, deciding the best way to show off projects and photography, but it is finished enough right now to show off a bit for critique. Check it out. Outside of my personal website, the blog, the Operable Window that I have been managing has been growing in readership. The intent of the blog is to share interesting creative content with any creative types looking for inspiration. Here is a look at what we explored in 2010. I will also still be contributing to my regular articles, The Frame, in Fresh Meat, our schools magazine/web presence. 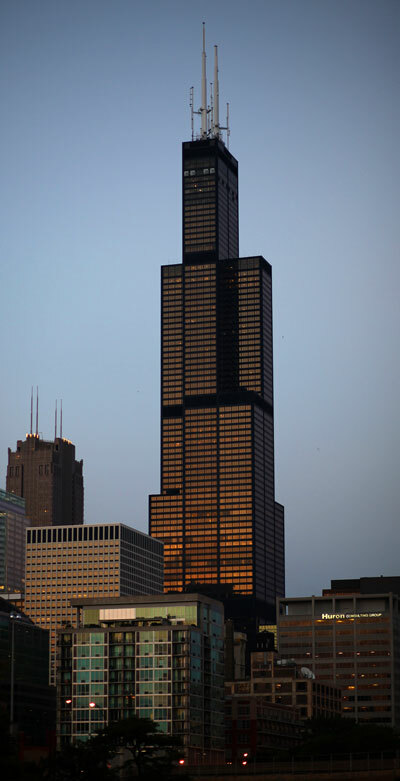 View from UIC of the "Sears" Tower. Great work Matt.... Dad A.I.A. With that said, as I am sure all can tell from my writings, I am by no means one to correct anyone about grammar/spelling/punctuation/anything that involves language. Apparently the use of the word syllabi is correct because of its popular use over time and eventual inclusion in English dictionaries. That is a lot of writing about something I don't really have strong feelings about. It is interesting though. Anyone have a real explanation of this?